A Better Absorb Shield quest is a mission in Final Fantasy XV. The Absorb Shield can be obtained when speaking with Tony in Cape Caem. He will offer you a weapon when you give him four Caem Carrots. Of course, when you upgrade it, the shield will protect you even better. 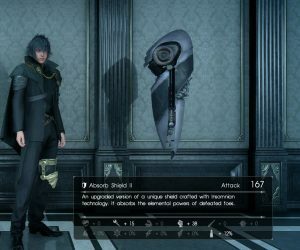 In this guide, we are going to show you how to upgrade Absorb Shield in FFXV. Note: This guide is a work in progress. We will continue to update it as we gather more info. Absorb Shield syphons elemental energy when you kill an enemy. It can be a valuable defense weapon, well worth upgrading. Apart from its attack stat, it will also boost your vitality and bullet resistance. You will need Spiked Armor to upgrade it. Of course, Cid is your guy if you want to do this kind of upgrade, so go and speak to him to receive the quest. He will require you to find a Spiked Armor. This item drops from Skarnbulettes. The best way to obtain it, and get some Gil for doing so, is to go to the Cauthess Rest Area outpost and join the hunt called Hammer the Cannibals. It will tell you to go to Kettier Highland and dispose of these monsters. They should drop the Spiked Armor. If that doesn’t happen, try to do the hunt again, until you manage to obtain it. Once you have it in your possesion, head back to Cid. You can also check into the outpost and take the 6910 gil reward from the hunt. Skarnbulette drops the shield needed for the upgrade. Give Cid the Spiked Armor, then go and do some other activities. After a few days, he will give you a call to tell you that you can check back and pick up your improved Absorb Shield. Vladimir Pantelic is a gamer, writer and a chill guy who rarely loses his cool. When he isn't writing about video games, you can usually find him playing basketball or paintball.